I have to create a small Intranet site for my company and I have to work with SharePoint Online. I added a Blog (from the prebuild template) for publishing articles but I cannot edit the page at all because the 'Edit Properties' button is greyed out. Does anybody know how to edit the site? EDIT: Mixed up 'Edit Properties' and 'Edit site', corrected it. I had a similar option in SharePoint Online trying to edit a Blog site homepage. Enable the site feature "Site Pages", then you can edit the blog homepage. To verify its not permissions, use a site collection admin account to test. Make sure all pages are checked in, it could be that the default page is checked out from the initial creation of the site. 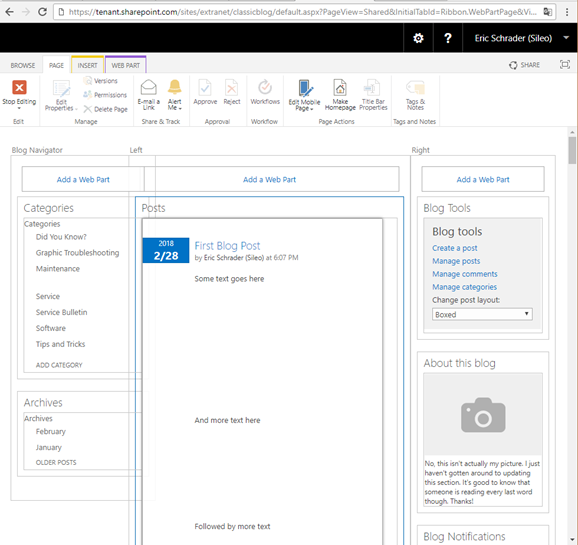 It's SharePoint OOTB page so we can't edit properties for that page. It is limitation by design. You can edit properties of pages which are under "Site Pages" and "Pages" library. Not the answer you're looking for? Browse other questions tagged sharepoint-online blog or ask your own question. how to have publishing, blog and wiki features together? Where can I edit the blog page layout? How to add a blog to a team site?